Jason and I started the weekend on Thursday night after school and work respectively. 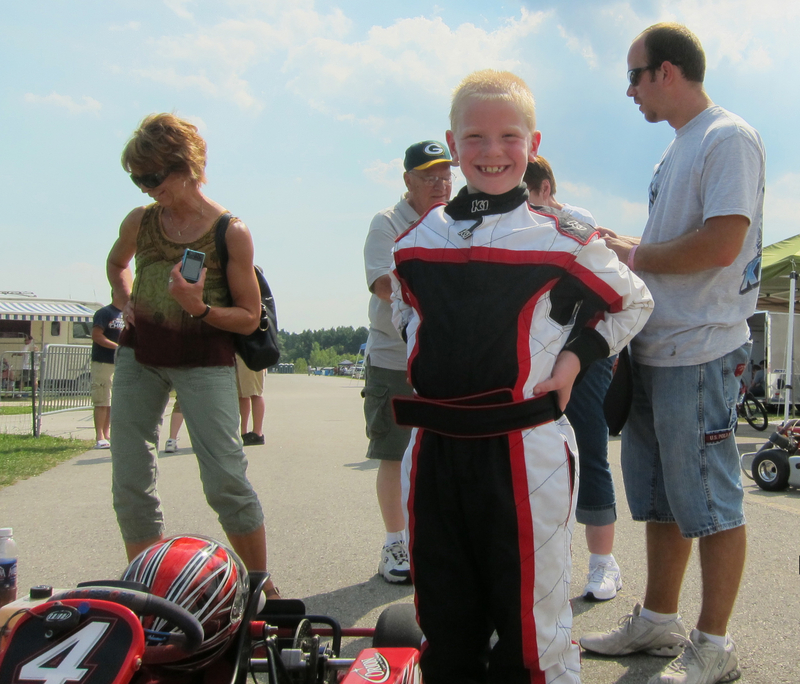 This weekend was the SCCA National runoffs at Road America and the last race of the Road America Karting Club Weekend series. We arrived in darkness at the carousel campsite. While I made camp, Jason immedatly made some new friends at the camp site next door. Once the tent was up and sleeping bags in we went to sleep looking forward to the Road America alarm clock of race cars roaring around the track. We where not disappointed. On Friday my wife and daughter came to hang out with us and watch all of the racing activities. They are not big race and car fans but it is nice to have someone cheering for you or with you. 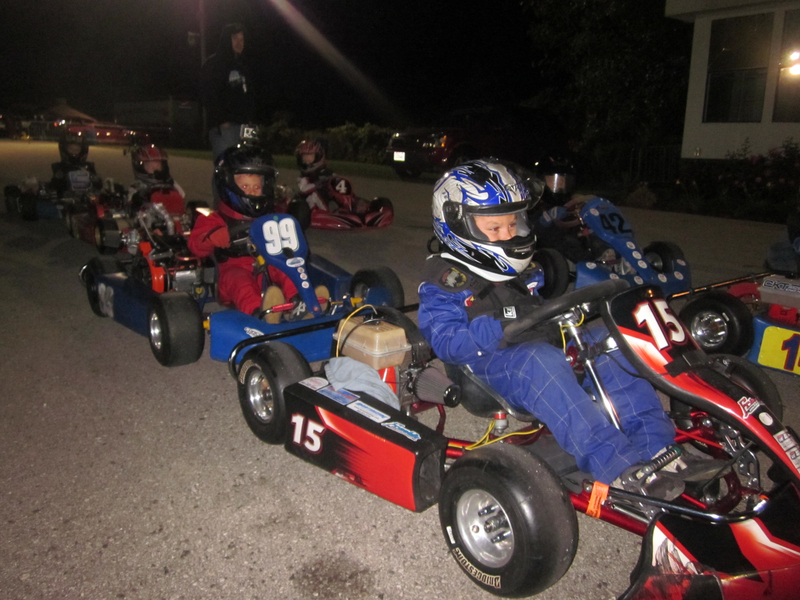 To add to the excitement of a night race the club decided to run the kid karts on the “half track” instead of the usual short track. The “half track” adds a long up hill run and a falling right hand corner called the drop and an off camber turn. This meant we needed to study over the next couple of days. I highlighted a track map with the new route and Friday afternoon we walked the track. This helped him visualize the new way round and start working out the line before he sets a tire on the track. On Saturday, we gave a map to the kids to look at and the track medic to them on the golf kart for a couple of laps. As with the other night race there were 4 practice(2,3) sessions. The kid kart track times are usually in the 28-32 second range on the half track they were now turning 46-50 second laps. This is actually closer to the other tracks we have raced at. Each session the kids got faster and more confident. A couple of them where still having trouble with the off camber turn but the rest figured it out. 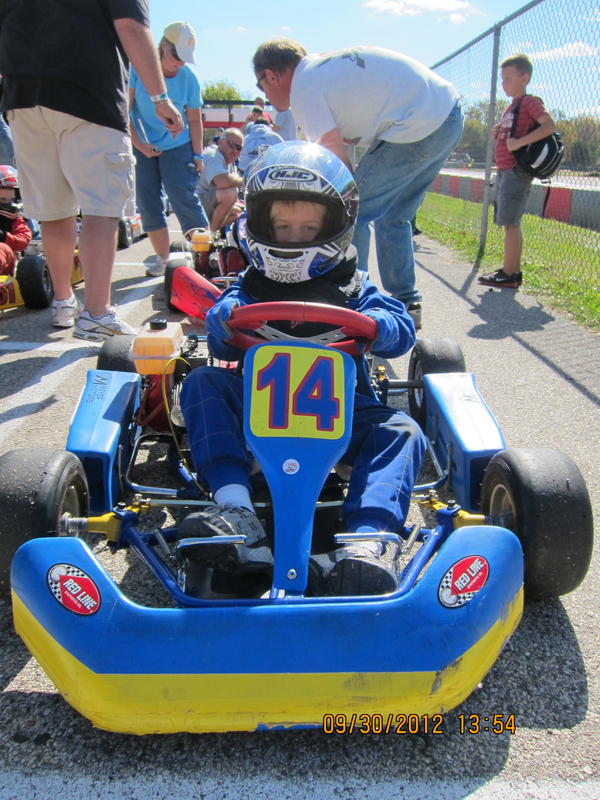 Most turns are “on camber” meaning they slope to the inside of the turn, allowing to kart to press up and against the track. On an off camber turn the road slopes to the outside of the turn. 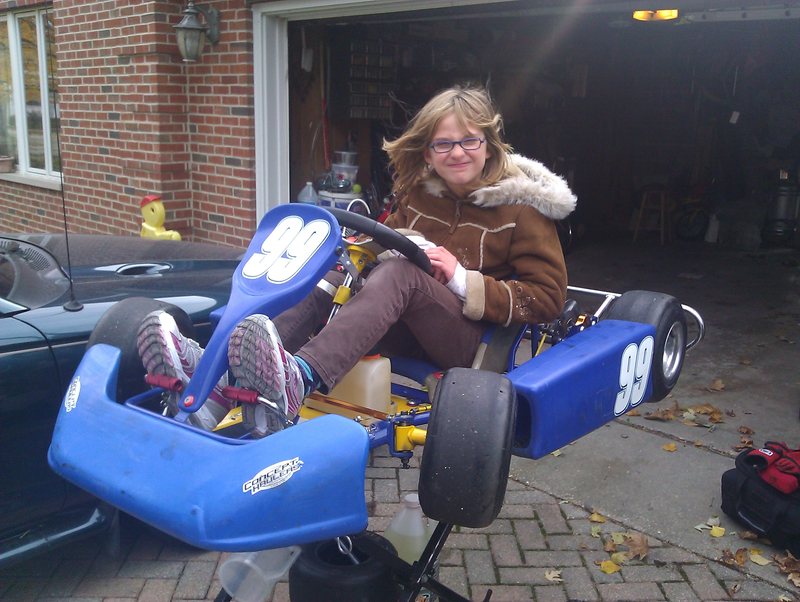 Now the kart pull up and away from the track. If you take an off camber turn too fast you are likely to spin out. The first heat of the evening started with Jason at the very back of the grid of 7 karts, a new high. At the start he made his way up to forth place, Logan(#42) took the lead, followed by Bryce(#14), Tristan(#1), then Jason(#99). Carmin(#15) zipped by Jason in on the way up the hill and passed Tristan just before the drop on the first lap. Everyone cleared the drop with out trouble but coming into the off camber turn, Logan took a spin and was passed by everyone up to and including Jason. Carmin also slipped by Bryce, so now its Carmin, Bryce, Tristan and Jason. By this time Tristan is starting to get the hang of things and is much harder to pass. A couple of laps later Jason, finally gets by Tristan when he spins in the off camber turn. Carmin and Bryce are pretty far ahead at this point and Jason spends the rest of the heat catching up. He was with in 20 ft or so of Bryce when the heat was over, not quite enough time to catch him. The finish was Carmin, Bryce, and Jason. Another excellent heat. The Jason sat of the pole for the first time at Road America for the second heat. Easton(#4) was in the number 2 slot, Logan was #3, Carmin behind Easton, Bryce in the number five spot and Evan(#5) next to him, with Tristan brining up the rear. At the start Bryce jumped that flag and had to fall back, Logan waited for the flag an took the lead. 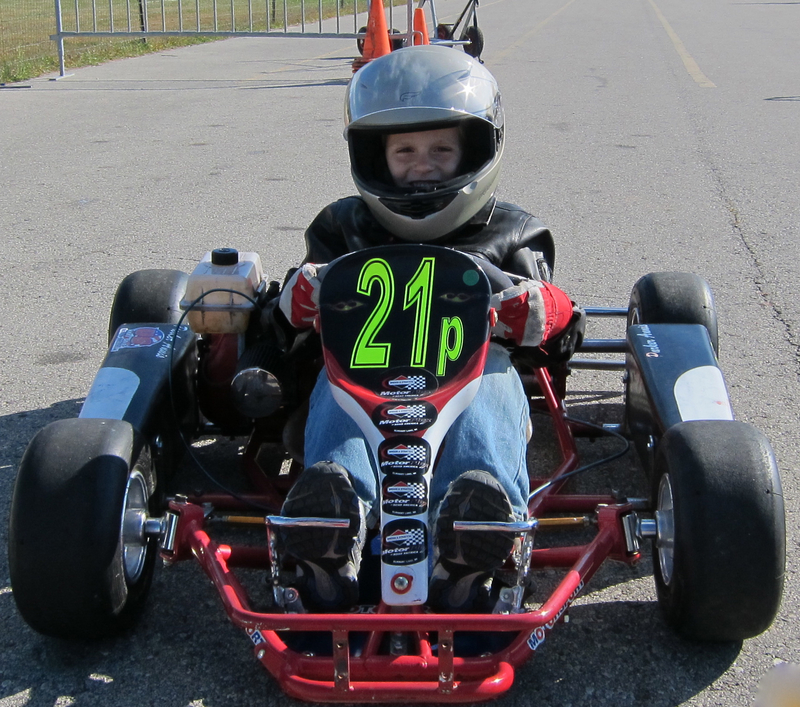 Jason followed him until they hit the off camber turn and Logan spun and fell back to 4th, putting Jason in the lead. Carmin worked is way up through the pack and got behind Jason. As Jason came up on Evan, who was lagging behind the pack, Jason slowed and Carmin got by at the start of the last lap. Jason worked on getting by Evan including trying to pass him in the top of the hat. He got by him on the exit of the last corner and cross the finished line in 2nd place. These heats where a real demonstation of skills he has worked on all season. The feature race should prove to be very exciting. The feature found Jason in the third position, next to Bryce, Carmin was on the pole and Logan in the second position. It was late, cold, and dark by this time and all the drivers where showing signs of getting tired including Jason. The start was a little sloppy with the karts spread out, but close enough. Jason dropped two spots, with Logan in the lead followed by Carmin, Bryce and Tristan, who had his foot on the gas. They ran this way for a few laps, until, while Jason was working to get by Tristan in the hat exit Evan forced his way by giving Jason a bump they both avoided Tristan’s spin out. This seemed to spook Jason and he just hung out behind Tristan not really pressing him. On the last lap Jason picked up the pace and was putting some pressure on Tristan in the off camber corner when Tristan spun letting Jason get by. Jason finished 5th and was very disappointed in his performance. It was a pretty rough ending to a long day. First time in a kart, turns out he likes it. We want to layout a lot of Thanks this week. Thanks to all the folks at Road America that made this summer possible, Race Directory Erick, Amelia in the office and checking weights, Gina for the time keeping, and all the RA track crew. Jason and Mark for answering my questions when we got started. Thanks to Jim at Fastermotors, Dave at US Kart Sales, Andy at JetKarting, for helping us get started and answering questions. Les and Greg at CHMS for giving an excellent place to practice. A big thanks goes to Brian and Steve Viking Kart Products for put the back in order after we learned some valuable lessons. A special thanks to Chuck at C&M Auto, for helping us get our Kart back together when the motor mount failed and taking excellent care of our team vehicle. To all the other racers and crew members for their great sportsmanship and love of racing. Including, Mike/Bryce, Brandon/Easton, and all the other kid kart dads and drivers, it was a blast guys, the stuff memories are made of. Finally to my lovely wife Karen and and daughter Katie who only have a passing interest in cars as they get them to the horses, but have cheer us on all season and let us run a little wild. To my Dad who gave me a love of motors.